Could you tell us about your childhood and family background? When I was born in 1967, our family was half in the city and half in the countryside. My parents had left their respective villages in Shaanxi Province in the 1950s, both moving to the provincial capital, Xi’an. The early 1960s were the famine years, following the Great Leap Forward, and to reduce pressure on supplies, city-dwellers had been urged to move back to the countryside. By that time my father was studying in college, so it was my mother who left, though we three children were all born in Xi’an; my sister is two years older than me, my brother four years younger. By the time I was born, the Cultural Revolution had already started. Everybody advised – and my father agreed – that cities were too chaotic to be safe, plus it would be more convenient looking after little children in their home village. So after we were born, my mother always brought us back to the countryside. We all attended schools in rural areas. My parents were from two different counties. Initially, we all stayed with my mother. When I was six, my paternal grandmother passed away. My parents couldn’t offer much daily help to my grandfather over there, so they decided to send me to keep him company. I stayed with my grandfather for several years on my own, without my sister or brother. Both my elementary school and junior high school were where my grandfather lived. But actually, it was an intermittent separation; I would go back to my mother’s from time to time. It was as if I had two homes for those years. What was life in the two villages like? Was kinship very important culturally? Both my parents came from the central region of Shaanxi Province, which had well-cultivated land and a rich agricultural tradition. Historically its development was much better than the southern or the northern parts of the province. My mother’s home was in Jingyang County, about 80 kilometers east of Xi’an; transportation wasn’t bad, with direct bus services to the city. The village had some sixty households. My father’s home was in a village not far south of Xi’an, in Zhouzhi County, in the foothills of the Qinling Mountains. That village is very big for Shaanxi, with a population of 20,000 by the 1970s – much larger than my mother’s family village. The two cultures were very different. To be sure, there were common features and, yes, some kinship factors, but primarily, life in this central Shaanxi region, Guanzhong, is relatively leisured. It is quite unlike the lifestyle in other parts of inland China, such as the provinces of Henan, Shanxi or Hebei. I have had the chance to visit the countryside there on numerous occasions, and I could always sense the difference. Comparatively speaking, people from our Shaanxi are more conservative. In my view this cultural conservatism is mainly due to the fact that Shaanxi did not get embroiled in the wars of China’s modern period. When did you start your college studies? I was in junior high school in 1978 and 1979, but I didn’t go to college until 1991, a whole decade later, due to family reasons. My father had studied civil engineering in Xi’an and had already graduated and been assigned a job at the provincial construction-design studio before the Cultural Revolution started in 1966. He stayed there all the time I was living with my grandfather and attending school in the village. Then, in 1981, my father was accidentally killed by gas poisoning. At that time the policy was that the deceased worker’s child could fill the employment vacancy, so I took up the position in the design studio and started work with a formal job. I was only fourteen. To begin with I was put in the ‘rear supply’ department, doing all kinds of chores. But the only thing that really mattered to me was to be able to study. In the dormitory where the unmarried employees lived, the young people all became good friends. We ate together and played together. Many of the others were college graduates, arriving every year once the universities reopened after the Cultural Revolution. From the 1977 class all the way to 1986, the design studio absorbed some of the province’s top-ranked students. Many of them were intellectually gifted. They all knew their art history by heart. This was the 1980s; for most people, it was a restless period – everyone had expectations, hopes for the future, for careers, personal life, and so on. That was what the 80s were like. But, in my view, it was also a rather banal period. I became very interested in the arts while I was at the studio. A wide range of projects were undertaken there, drawing on different disciplines, of which architecture was the closest to art. At the same time, architecture is the most practical of the art forms; it is the combination of art and utility – so people trained in architecture tend to lean either towards artistic or practical directions. But studying architecture gives people unique strengths compared to art school or film school training. Students at art school tend to have special talents in one area or another, but they are usually not so well informed or good at conceptual thinking. It is very different for architecture students, who have to study mathematics and other science courses, and as a result, think and argue very logically. Relatively speaking, they are much stronger in intellectual terms. Did you think about studying architecture at the time, or civil engineering? I never thought of majoring in civil engineering. I initially thought about architecture. I worked very hard to prepare for the college entrance exams – by 1984, I was working mostly on preparing for the special tests for architecture. But then I took up photography in 1986 or 87. I also took up painting, in about 1988. At the beginning it was mainly due to curiosity, but it was also because I had to decide on a major for my college studies. Architecture had very rigorous entry requirements at the time, so I thought about the fine arts. My friends at the studio all had basic training in painting, so I learned from them and painted together with them, which helped me prepare for art school. But it was highly competitive, getting into a fine art course, and what I had learned in the studio was far from enough. For me, photography became the only route. Plus I’d already had a camera for several years and had been practising before I started painting. Though I hadn’t published any of my photos, I had gathered enough experience. In 1991 I entered the Lu Xun Arts Academy in Shenyang, in the northeast, majoring in photography. So you studied photography. When did your attention turn to cinema? I was already thinking about changing to film in my second year at art college. I started buying books on film and doing the preparatory work. In my last year, before graduation, I went to visit the Beijing Film Academy and asked at the cinematography department whether I could enroll in the short-term training programme there. They said yes. They were very nice to me, since I was coming from a very good course. Actually, a year before my graduation from Lu Xun Arts Academy, I had already decided that, instead of going into the job market, I would continue my studies, which is what I did. After graduation, I carried on taking classes in Beijing, still working with a camera, but now in cinematography. How long did you study at the Beijing Film Academy? How many were on your course, and was there a lot of discussion? The training programme was initially for one year, but I stayed on for another. There were many classmates, and I also made many friends. But the main difference between us was our backgrounds; most of them were there on temporary leave from their formal jobs, whereas I was a new graduate from a formal art school. Our previous learning experiences were different, in terms of basic training. Most of them had not been through rigorous formal study. Photography is still, while cinematography is in motion. Did you have to pass through a familiarization process between the two? Photography as a form of visual art has its own properties and characteristics. Many people maintain a lifelong engagement with it. I used to spend day after day in the darkroom when I was a student in Shenyang and gained some understanding of the form and working process. However, personally, I was not particularly attracted by the seizing of a given moment; for me, the moving image was far more interesting. It provided a unique way to enter the reality of our time, to present the many facets of human life in a holistic way. As for familiarization, it is after all a question of material, whatever form you are engaged in. For example, for a journalist engaged in writing, familiarity with language is a must. For me, in both photography and cinematography, the basic language is the image. Of course, I did not have a thorough acquaintance with the moving image when I first got to Beijing Film Academy. But it was a question of turning quantitative accumulation into qualitative transformation. Learning became something in one’s own hands. In fact, after spending a couple of years getting into the field, film school would stop offering real solutions. From joining the design studio, aged fourteen, to entering college, aged twenty-four, you had a whole decade to learn about the arts from various perspectives. Were you aware of the difference between East and West at the time? I was not conscious of it before I went to Shenyang. In the 80s, the things I learned and books I read were all European – and there, classical architectural history is not divided from the other aspects of art history. Architectural projects involved painters, sculptors and other artists working together; it was not divided into different professions. There was no stand-alone architectural history in the past. We have to view architecture as part of art history – a very long history, inclusive of all kinds of art forms. For me, awareness of ‘East’ and ‘West’ came after I went to college, when I started to understand Chinese traditions. After I turned to film, I paid much more attention to this issue. Did you see many films? Which ones had a particular influence on you? We watched a lot of films, every day, of all different genres. But I couldn’t help noticing that, though the history of cinema appears to be very rich, it is also quite simple. That is to say, at first sight, you would see many different filmmakers, different schools and national traditions. However, going over the field in a systematic fashion, you could get a relatively comprehensive understanding, an overall picture of it. Art history is very long, while film history is quite short. With a history of just over a hundred years, cinema is not an old form. Plus, not long after motion pictures came into being, the form had already permeated the culture of people’s daily life. In Europe and America, starting from the 1930s and lasting all the way to the 1970s, cinema reached the peak of its influence, as a vital part of cultural life. Various schools and traditions emerged – American, French, Italian, German and Soviet Russian – each formed by its respective environment and social context. Cinema has its own functions and requirements in each society. For example, film in Soviet Russia went on to become a propaganda instrument, whereas in the United States it quickly turned to serving commercial interests. From the beginning, experimentation and explorations differed from one country to another; the directions taken by cinematic innovation – both formal artistic features and technical advances – relates to the local socio-cultural history. In discussions with your fellow students, did you focus on technical questions like camera work, or was your attention already turned to filmmaking in general? It was not just about camera work. From the start, our interest was in grasping the whole, instead of particular aspects that had been singled out. The first year was really learning about cinema – about its history, its contemporary development, and its various national traditions. In short, the aim was a comprehensive understanding of film. After working in this way for a whole year, we were able to give a basic summary and evaluation whenever we saw a film. A kind of foundational direction in filmmaking was gradually clarified. At the time you turned to filmmaking in the mid-90s, Chinese directors were enjoying rising international recognition. Was your own thinking influenced by the Chinese cinema of those years? No, I didn’t pay much attention to that. I don’t much like those films. It is not to say I dislike an individual filmmaker. In fact, although some Chinese films had been winning international prizes since the 1980s, they are culturally still quite barren, lacking in the richness and unpredictability that are characteristic of world-class art. Modern art involves a broadened understanding of life, but I don’t think those films have such a spirit. The reason? In addition to the problem of cultural markers or signposting, it is mainly – in my view – a question of continuing filmmaking within the establishment of the PRC. How about the 1990s filmmakers who sent their works abroad secretly, to participate in film festivals without official approval? Aren’t they relatively independent and no longer making film within the institutional establishment? It is not easy to judge. When I say filmmaking within the establishment, I don’t mean to denounce anyone. What do I mean? It’s simple. Films of the establishment carry some inherent features that are in conflict or contradiction with contemporary culture; the outlook of the establishment is still there in the films. Therefore, they are not yet contemporary, not really a work of modern civilization. In some ways, this is also due to the history of Chinese cinema. Does this mean you also saw a lot of films from the early half of the twentieth century and you view contemporary films in connection to this past? Oh, yes, we saw all the films. Once you are in the field, this is your life and you ought to know them. I’ve always done this – I still watch films every day. This is part of your life as a filmmaker. As for China’s cinema history, when film arrived in China, it was like a seed landing on the soil. It made contact with the people living in this land and they, too, formed their perceptions about it. The Chinese did not take cinema as representing a new civilization, nor did they consider it as another cultural form. If you study the situation, you realize that, for Chinese people at the time, cinema was not much more than a plaything. It mainly took the fancy of some rich people, who found this new toy quite fascinating. What we have from the early days are shots of random juggling or stage performances. It is not like what happened in Europe. For example, in France, film grew into a new civilization, a very strong cinematic civilization – very different from China’s case. This is how localization worked initially. But Chinese cinema underwent many metamorphoses over time, taking in influences from American, European and Japanese films. The Chinese started to realize that it was not merely a new toy to play with, that it pointed to a new kind of culture. Yet this was also a period when China itself was changing very rapidly; developments in politics and economy accompanied the history of its cinema. Nowadays conventional formulations would characterize this period as ‘leftist cinema’. But in my view, it could hardly be defined as such. The cinema that developed in Shanghai before 1949 was the most brilliant period in Chinese film history. Watching the films carefully, you can detect a mixture of ideologies behind the scenes, far from the versions in our textbooks. It should be easy for us to consider this period with a calm and reasoned eye, since it is now a historical question. For me, there are three factors at play in the films from this period. There are the works influenced by the international Communist movement; then there are the commercial- and star-centred productions, modelled on Hollywood; finally there are the ones based on China’s own intellectual tradition. Watching a film, you can find some elements of Communist ideology, some expressions of traditional literati morality, and at the same time the dominant star-system at work. Some films appear to be urban avant-garde, and some have traces of French or Italian realism. In fact, most of the films are a mixture. Their different styles are often due to the varied backgrounds of each director. Most Chinese filmmakers and commentators do not seem to care very much about national cinema history. I think this is a big problem in China. European scholars discuss Chinese cinema from time to time, but with their limited understanding of Chinese society, they couldn’t undertake detailed studies, even if they offer interesting opinions. In contrast, they would invest huge amounts of time and energy in studying the cinema of their own country in the context of its immediate cultural-historical background. The history of national cinema emerges from that type of study. But there is no equivalent work in China. There is a lack of effort – judicious, clarifying, rational effort – in constructing our own history of cinema. Of course we need to understand the history of world cinema and that of other countries. But what is more important is to have a clear view of your own country’s film history, as well as contemporary filmmaking and the socio-cultural order of your own country. What is the nature of film within our overall cultural context today? What is the actual state of cinema right now? As a filmmaker, one has to have the patience to reach a certain self-understanding. This is my view. You returned to the northeast, to Shenyang, at the end of the 90s and started shooting West of the Tracks (2003), your epic documentary on the destruction of the rust-belt industrial district there. How did you decide on that theme? I spent more than three years in Beijing, sometimes working on television series or as a cameraman. Then I decided to shoot West of the Tracks. I already knew the industrial district of Tiexi very well. When I was a college student in Shenyang, I often went there to photograph at weekends. Its factories, its workers and residents – I became familiar with the place. On the other hand, the decision also came from a perception about our time: there was a feeling of desolation that reminded me of Tiexi District – the sense that a history which used to be important was now slowly declining, dissolving in front of our eyes. Thereafter, my question was how to tell a relatively coherent story with such a theme and so many characters. It involved confronting the factory complex, its routine of production and human life? Yes, of course. Having decided on a theme, each filmmaker will then choose different technical approaches. In practice you consider how to deploy your own technical devices to make it viable and that’s all. Many people asked me why my first film is nine hours long. But there are no particular secrets. It’s nothing special for me, personally. I don’t feel anything particular even today. But didn’t you anticipate resistance from your audience? And what were the main problems in making the film? Resistance? I never thought about such things. If you want to make a film, you have to work on it, to realize your plan from start to finish. For me, my job is to get things done. It didn’t involve much exploration of the language of presentation and representation. It was mainly the actual work, practical matters on a daily basis. I didn’t have much difficulty getting into the factories, making friends with workers, and so on. That was all quite simple. The most difficult part of filmmaking is money. You need to shoot every day, to manage a mass of details every day. The work required a continuous input of material resources. Basically my friends and my family supported me. But even so, you still didn’t take potential audience resistance into account? Eh? The cost of a film is a different matter from its box-office returns. It’s not related to that. I don’t think about the box office while making my films. That’s not to dismiss it completely, but the two are not inter-twined. When you want to make a film, it is not because you expect an economic profit from it. I am not saying this to defend the purity of ‘art’. The main point is, the two are not related directly to each other. You are working on a project. It is obviously not going to make a big profit. Yet, if you believe it is an important thing to do, then you should go and work on it. It is not something decided by economic considerations. Later on, you made two more documentaries, Crude Oil (2008) and Coal Money (2010), which seem to continue the theme of West of the Tracks. Crude Oil lasts for fourteen hours, recording a group of workers at an oil field in the wilderness of China’s northwest Qinghai Province during a cold winter. The screening of the film in Los Angeles was in an exhibition space where the audience could walk in or stray out randomly. In fact, rarely did anyone sit there through the whole screening. It is like a work of installation art. Was that intentional? Yes, it was. It was for the Rotterdam Film Festival. People there wanted to have a section of installation cinema. They came to ask me and I accepted their invitation. It was specially made for the purpose. It did not come with much money. As I was working in the northwest at the time, for convenience’s sake, I decided to shoot the oil field. These three films are all related to heavy industry or the energy industry. However, in Crude Oil there is little conversation or action, either inside the workers’ lounge or outside by the rig. The monolithic impression of the film is not interrupted even when they do speak or move around, an effect further reinforced by the long shots typically lasting for a few minutes. It is quite different from West of the Tracks, where the viewer has a strong sense of lived life, a previously existing community, as well as the bond to a collective. Is the contrast due to the difference in locations? No, it’s not. This is the changing China. Factories of the past still had a collective spirit. Workers’ lives were related to the factories. For instance, if you were a formal worker here, you would be considered part of the ownership of the workplace. Likewise, people’s daily life was closely related to their work relation at the factory. That is no longer the case for production units today – now there is a contract-labour system everywhere. It is a simple relationship of hiring, often temporary. The oil fields are no exception. In China today, apart from civil servants, everyone is on the contract system. The workplace is no longer intrinsically related to your life. Therefore, the workers in Crude Oil may have their contracts coming to an end, either this year or next? That’s because of the actual relations of production today. The system has changed, not only in terms of economic relations at the workplace, but that of the whole society as well. When a company decides to hire you, it could be for two months, three months, a year, or three years; and it will pay you according to how much you work. The film itself documents this. We did not set out to exaggerate or diminish the situation. You can form your own judgement after viewing it, but that comes afterwards from you as a viewer; it’s not our intention. In Coal Money, you followed the truck that transported coal from Shanxi Province to the port city of Tianjin, to catch sight of how people, from near the coal mine to those along the road, were trying to seize opportunities to change the coal passing through their hands into money. Does this also aim to capture the new times from a slice of our social reality? The film Coal Money is an incomplete project. We shot a lot at the time. But it was done for a television programme in Europe, which only gave me a fifty-minute slot. The producer, a French company, actually understood the problem. They asked me to make a complete version afterwards, but I didn’t have time to go back and work on it again. Within the fifty minutes, it wasn’t easy to narrate a coherent story. It is not a completed work. Would you agree that compared to your longer works, the people in this film are much more lively, often proactive? That’s right. It is the changing nature of our time. We can see that China today is not exactly the same as it was in the years when I shot West of the Tracks. Nowadays, you can see the hardship in people’s lives, but there is also creativity, energy and vigour among ordinary people. You can see that, under the unfavourable conditions of a backward economy, simple production methods and the constraints of the system, the ordinary people are working hard to create wealth through their own labour. It is the flow of life in our time. Chronologically, your next work after West of the Tracks was He Fengming (2006). Thematically, this work is related to your feature film The Ditch (2010). Both are about the labour camp, Farm Jiabiangou, in northwest China. The camp was set up to hold the ‘Rightists’ in 1957 and closed down when most of the 3,000-plus prisoners there starved to death during the Great Famine of 1958-60. By the time the government ordered all the detainees to go home in early 1961, only a few hundred still survived. Isn’t this a very different topic from the films we have just discussed? In fact, I turned to the story of Jiabiangou as early as 2004, right after West of the Tracks. I was drafting the script and planning things at the same time as making Crude Oil and Coal Money. My main focus was always on Jiabiangou. It took me seven years to get He Fengming and The Ditch done. The other films were, in a way, by-products that I did in my spare time. Why did you choose this topic and spend so much energy on it? I first learned about the camp from Yang Xianhui’s book, ‘Stories from Jiabiangou’. I was shocked. I managed to contact him afterwards. Meanwhile, I went out to collect more materials, do my reading, and conduct interviews. In 2005, Yang Xianhui introduced me to He Fengming. That was when I made the documentary about her. It is obvious to me that Jiabiangou occupies a critical position in China’s modern history. For one thing, the international Communist movement was introduced to China almost a century ago. During this whole period its ideology has had a major impact on the people of this country, bringing about tremendous transformations as well as causing sharp conflicts in people’s lives. Jiabiangou itself did not last very long, but it harbours singular significance in our modern history. The camp is very important for us in understanding our own past. In your documentary, He Fengming tells her own life story. When the PRC was established in 1949, she was an enthusiastic high-school student eager to participate in the Revolution. Less than ten years later, both she and her husband were labelled ‘Rightists’ and sent to separate labour camps. 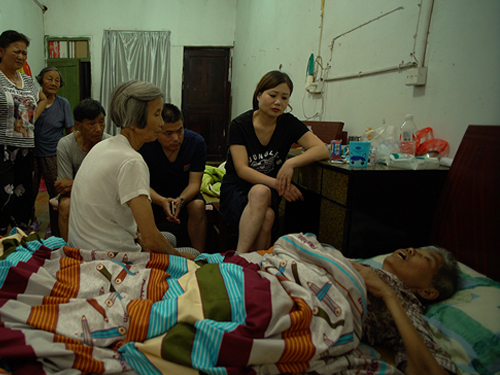 When her husband starved to death at Jiabiangou, she was not even able to pay him a last visit. To protect her children and herself during the Cultural Revolution, she destroyed all written records from the earlier years. But she never gave up her effort to recover their shared memory. Eventually, she was able to publish her memoir in the 21st century. Your film starts by following He Fengming walking through the snow to her home. But thereafter, the camera never moves. It is not exactly in interview form either, for the film does not record any interviewer’s questions. 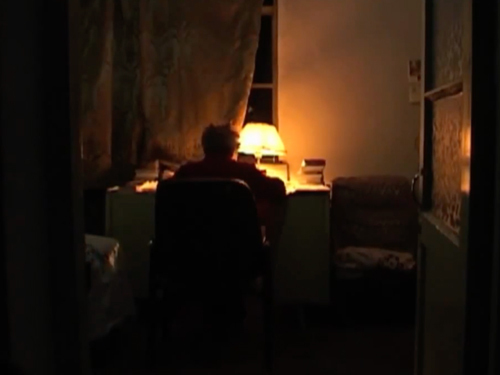 The whole film is basically He Fengming sitting in her chair, speaking to the camera to tell her story, with only a few moments of exception, such as when she stands up to turn on the lights. Was this intentional? Indeed, it was planned in advance. It was decided when we first met with He Fengming. We wanted to make it like that. The actual shooting went on much longer, of course, but the format was the same. I don’t usually worry about whether the audience will accept the way my film is designed. You are the filmmaker; it is your job to make a convincing work. Instead of worrying about the audience, you should search for ways to make your film a good one. To me, it means to look for, or create, a potentially better cinema that fits your needs in making this particular work. At the same time, your film must be capable of accommodating the living reality of its subject. Your camera is fixed at quite a distance from He Fengming. Didn’t you consider giving her a few close-ups? Or was it that you didn’t want the camera itself to catch the interviewee’s attention? I don’t think these are problems. Filmmaking can deploy various tactics: close-up or long shot; camera in view or hidden; conscious performance or spontaneous reaction. These are not important issues. The key is your choice. The technique and style you choose for a film should be appropriate to your subject matter. What is really important is to establish a relation between the subject of your film and your audience. It is the camera that creates this connection. For me, the main concern about this relationship in shooting He Fengming was to make it low-key – to leave it unnoticed, or maybe even banal. But shooting such a film means establishing a connection not just to each story, each character, but to history. In fact, it was a social phenomenon at the time; many people who had lived through that period wanted to write their memoirs and tell their stories. Why? Because our mainstream culture, the dominant ideology, does not offer them an identity through which they could recognize their own lives across the passage of time. Another question I have been repeatedly asked is why people should trust the old lady’s account. For me, this has never been an issue. I assume she is trustworthy and that is all. A big problem in our social life is the weakening of human relations: from major events to daily contacts our society has evolved into an environment where people do not feel they can trust each other. But this wouldn’t work for me. I don’t approach people with suspicion. No, I needed to establish a relation of trust with her. There was no reason for me not to trust her. Moreover, why couldn’t we simply listen to her? At least, we could learn about another human being, about how she lived her life. In that case, why did you decide to make a feature film of the same story, with The Ditch? As I mentioned earlier, I believe Camp Jiabiangou has a significance for modern Chinese history – while as history it is part of the past, no longer a living aspect of our present. But it was also a personal choice to make it as a feature film instead of a documentary. Though there are still pressures from various directions, we also have spaces and freedoms – it is a question of exploring possibilities. So, why shouldn’t I try to make it as a feature film? In the narrative processes of He Fengming and The Ditch, from screenplay to editing, how did you approach the conflicts between the lived experience of individuals and the ways in which historical events are presented? I don’t think I was impeded by such conflicts. What is important for me is, firstly, that you can accomplish things today through your own efforts, and also that it is possible to adopt a personal perspective when looking at historical events – and that I could do so through my filmmaking practice. This was an important factor in the whole shooting and production process of The Ditch. People are used to the kind of historical film that covers a long time span, weaves a complicated narrative and provides rich period atmosphere. But this was not my approach. I wanted to rethink how to view cinema and history, including how to handle time and narrative. I didn’t try to present the story in its totality; what I included in the film is only a tiny part of the larger historical event. In this sense, The Ditch is quite simple. It might disappoint some viewers, but I feel quite satisfied with it. The Ditch does not provide any information on the ‘Anti-Rightist’ Campaign of 1957, nor tell the viewer the origin of the labour camp. It covers only the last and worst days that the ‘Rightists’ spent at the camp in the winter of 1960. Similarly, it does not narrate the life stories of the central characters, apart from giving fragments of background information through casual dialogue. How then did you consider the question of time, in such a historical film? It is impossible for us to recover history today, but we can sense the existence of it. With a historical event, little pieces remain within people’s memory. History exists in these scattered memories. Thus, my film consists of small parts. This part is on one character and that part is on another. One episode of this guy and then a different episode of another guy – they are all happening in the same place and within a month. These are all related, in symbiosis with each other, and the unity of time is shared by all. We did not try to build up the development of a character or a complete narrative. Nor could you say that Jiabiangou labour camp is the central character of the film – after all, The Ditch presents only a tiny part of Jiabiangou’s history. It isn’t aimed at giving the whole history of the camp and in any case, I didn’t have the resources to do so on a large scale. But I could still shoot the small portion of the time that truly interested me, and through it, we may gain a glimpse of that historical period. While making The Ditch, you also made another documentary, Man with No Name (2009). It appears to be about a new theme, isolation and solitude; yet it is also a human study. Was this intentional? Formally speaking, in contrast to He Fengming, which records a single person talking through the whole film, Man with No Name does not have any dialogue at all. It was completely accidental that I stumbled into this man. We were taking a break from shooting The Ditch and a friend was driving me around the barren wilderness, when this man came out of nowhere. Somehow I was moved by the way he was living. I think he brought us the experience of his own life. We are living in a time of growing material desires, both individual and as a society. It is a time of hypertrophied desires. Then here is someone who might be the poorest, the loneliest, but also the simplest, someone on his own and pretty much self-sufficient. He lives alone in the wilderness, without contact with other people. He doesn’t need to beg from others. His is a natural state, like grass sprouting in the spring and withering in the autumn. In the process you could see a human’s experience of living at its most basic. It was this that touched me. While shooting He Fengming, I was indeed curious to explore the extent to which language could sustain a film. But the reason for using no dialogue in Man with No Name is rather simple. I asked the man if I could film him, but he would not reply. There was no communication at all. So we went on to film his state of existence. The theme of basic survival also appears in your latest documentary, Three Sisters (2012). Again, you encountered the three girls by chance. You’ve said elsewhere that you met them when you went to mourn a writer in a remote area of southwest Yunnan Province. How did you become friends with him? The writer’s name is Sun Shixiang. Actually, I did not know him personally before he passed away in 2001, at the very young age of 31. He and I belong to the same generation. He is best known for his novel ‘Shenshi [Story of God]’, a fictionalized memoir of his own life story, starting from his childhood and published posthumously in 2004. The novel is more than a million characters long. It is rich with all the aspects of human life Sun Shixiang witnessed. In addition to his own story, he tells those of his parents, grandparents, neighbours, relatives. I think he shares the same worldview as me. Moreover, I feel that I, too, have lived the kind of life he tells in his novel. He has effectively told the life story of our generation, from childhood to maturity. It is a lived, sensuous experience as well as a spiritual one. I am not a writer or a literary critic, but I think ‘Shenshi’ is one of the few really excellent novels in contemporary China. I read a lot of contemporary literature, but many of the works are far removed from our life. I don’t mean personal lives: it is the life that our people are actually going through in this historical period, this national social process. Most works are unable to express this lived collective experience, which is intense but often rich and powerful. To me, these works are simply too naive. I read Sun Shixiang’s novel quite early on, while working on The Ditch. I knew he’d passed away, but I had always wanted to visit his home, to see his parents and his family. I was busy with shooting at the time and was only able to make the trip after The Ditch was done. For me, it was also to visit his tomb and pay my respects to him. How did you meet the three little sisters there? As your film shows, they are living mainly by themselves, without parents to take care of them. Sun Shixiang’s tomb is on a high mountainside. On our way back down-hill, we happened to pass this village. We stopped our car there and saw the three children by the road. This was three years ago, when the eldest sister Yingying was seven and not yet going to school. By the time I started shooting, Yingying was ten, and the two younger girls were about six and four. I started chatting with them, and they took me back to their home and cooked some potatoes for me. It’s like that in the countryside. I am used to the ways of village life; they don’t feel strange or alien. I don’t feel intimidated or hesitant about going to a stranger’s home in a village. It isn’t a big deal for me. Did the life the three children were living remind you of your own childhood? When I was growing up in the 1970s, life was still very poor in China. Everywhere, across the whole country, people didn’t have enough food to eat or clothes to wear. Of course this kind of material poverty left deep impressions in our memory, with many details. Since the 80s the country has basically been on the path away from this poverty-laden state. From the 90s on, problems of this sort have gradually been put behind us. Therefore to a certain extent poverty for us is a question of memory. Then when you come to this mountainous region, all of a sudden you’re confronted by the same poverty, right in your face. It is true there was general poverty throughout the country in the 1970s, but wouldn’t you say it is a new phenomenon for parents to leave such small children behind to fend for themselves? Yes, this is a new phenomenon, occurring in a period quite different from the past. This is not to say that people always used to live a happy family life. Instead, it was primarily a state with a high degree of certainty. People’s private lives were restricted by society: you could not easily get a divorce, or go away and leave your family of your own free will. The problem was not merely the ideology: we could see that all our activities were controlled. In those days you couldn’t daydream about leaving, if you no longer wanted to live with your wife or husband. It was actually impossible. You didn’t have the freedom to search for your own personal life. Again, not that people were living very happily in those days. These are two different things. These problems have emerged now, but this is not necessarily completely bad; to a large extent it is due to economic developments. In fact, with many people working hard their whole lives long, economic relations exert a powerful control over people’s lives – much more powerful than the ideological control of the past. Why? It is simple: look at this small village, poor and remote – all the capable young workers have gone to search for employment elsewhere. You could say that the economy is worse – more horrifying: it exploits people by getting them to make the effort voluntarily, of their own free will. Three Sisters lasts two and a half hours, with many long shots, mainly following the children’s daily life, with limited dialogue and no voice-over at all. Yet the images were so powerful that, when we saw it at a packed theatre, the audience was transfixed from beginning to end. This suggests you have great confidence in the images’ ability to connect with the audience? The film has two versions. One is 90 minutes long, made for a television programme. Usually films for television are about 50 minutes, so this is already quite long. The other version is for theatre and lasts for 150 minutes. As I said, a film establishes its connection to its audience through the camera. It is not that the images are necessarily very attractive or appealing. I think what matters is the manner in which the filmmaker works. When you keep on watching, when your attention is continuously trained on something, why is it that you want to look at it, and then to show it to your audience? There has to be something people care about, something that carries on growing. The inner richness of the girls’ characters, all those details of their lives – these keep unfolding, offering the audience the chance to reflect on this increasing complexity. The children radiate kindness, instinctively. Even the younger one helps feed the pigs and goats. It is a very poignant, simple relationship between human and animal. Many things in this film are actually very simple, but it brings out the basic realistic side of human life and feeling, through the life and feeling of the children. A rich film is not an advertisement. It says something about human existence, about the basic things in our life. Three Sisters is set in a poverty-stricken environment, but the film as a whole is not about poverty, it is about the lived experience of the girls’ existence. As your film shows, the father of the three sisters who has gone to work in the city comes back to the village each year to plant potatoes, their main food supply. Yes, and obviously, he has problems. 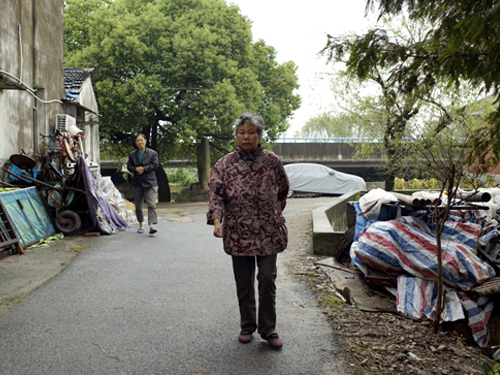 This raises a new issue that has emerged with China’s economic development: a huge number of villagers have moved to the cities, but although their labour has contributed enormously to the urban economy, their wages and their living standards remain low, and so the countryside becomes even poorer than before. After these young labourers have paid for their living expenses in the city, for food, lodging and so on, they have little left. When they return to the village they don’t bring much back with them, after all their back-breaking labour. The girls’ father is not old, but it’s obvious he could have lived a little better if he was on his own. With three children, he can’t save anything in the city, so he has to come back. In that case, the film is not about loneliness, either? In Three Sisters there are invisible constraints. We haven’t said anything about the children’s mother, but she is not part of their daily life – the fact is, she has left the girls on their own for years. We only see their father, and a few other people around their home. But although they appear to be three lonely little figures, they actually live inside the economy of our times. The economy has kidnapped every one of us. In this sense, human relations today are essentially economic relations. The economy assigns the positions people occupy and continuously reinforces them. These positions, in turn, are often invisible. Does this correspond to what we discussed about Crude Oil and Coal Money? Yes and what we see is actually an unspecified social relationship in China today. Do you think that when children like the three sisters grow up, they will be longing for the cities too? It is not that the child will be longing for the city, but that China’s economy is centred in the cities. They are like magnets; it is not a question of personal will but economic relationships. Actually, it’s not that China’s economy was centred in the countryside in the past: for a very long time there have been deep distinctions between the rural economy, the urban economy and petty industry; but these different dimensions maintained a certain balance between them. Now heavyweight economic power is located in the cities, which have become centres of extraordinary wealth. People are drawn to this wealth to make a living, seeking opportunities. The magnet’s energy determines the size of the regions it affects. You once said that in China, only Shanghai has an urban culture; it doesn’t exist elsewhere – Beijing’s is essentially a political culture, for example. Now that the cities have become such magnets, will this lead to a growing urban culture? Or, alternatively, will culture be thwarted by the hukou residency registration system? I don’t think it will slow down the trend. That comment was made in a discussion on Chinese cinema. China as a nation was based on agrarian civilization; the social ideology of the majority today, at its core, is still within that frame. As to whether – or how – an urban culture might emerge when most of the population lives in cities, these are questions for a future time. But the cities will orient development, and cinema too can contribute towards urban culture. These changes are bound to come, bringing changes to all the other aspects of our life as well. It’s not a question of whether I want it to change personally. Does this mean you believe cinema has its own vitality? It will change just like other things. Our world has become more and more dependent on the visual image, though we haven’t given it much thought. In the past, images did not play such a crucial role, though we had a rich civilization based on the written word. Rules for composition, word games, narrative genres, descriptions of manners, all were components of a culture created by the application of the written word. The art of the moving image has a much shorter history, but it has expanded and changed at a very high speed. There are many possibilities for contemporary cinema; it will not be confined to what has been accumulated in our repertoires from the past century. ‘Filming a Land in Flux’ was first published in NLR 82, July-August 2013. The interview with Wang Bing now appears on Sabzian with the kind permission of New Left Review. For an extended discussion of Wang Bing’s 9 hour documentary Tiexi qu [West of the Tracks] (2002), see Lu Xinyu, ‘Ruins of the Future’, NLR 31, January-February 2005; and for a survey of the contemporary movement in China, Ying Qian, ‘Power in the Frame’, NLR 74, March-April 2012. Cinéma vertical, films qui marchent. Cinéma horizontal, films qui gisent. Des uns aux autres s’ouvrent le même temps, la même durée étrangère aux lois du travail, de la raison et de la santé. Comment, et jusqu’à quand, une vie peut-elle se prolonger, à partir du moment où elle semble comme sortie d’elle-même ? De quelles virtualités d’action l’inaction a priori la plus complète est encore grosse ? De l’infatigable marche à la fatigue des gisants, s’il y a un spectaculaire bouleversement des postures, se développe aussi une commune persévérance : le geste de Wang Bing dégage d’ultimes fragments de possible du cœur de l’épuisement. In het midden van de film gebeurt er iets geniaals, waardoor we uit Fengmings verhaal naar het heden worden gesleurd. Op een bepaald moment onderbreekt Wang haar om te vragen of het licht eventueel aan zou mogen. Het gesprek begon in de vooravond en zonder dat we het als kijker echt beseffen, is Fengming ondertussen volledig in het duister gehuld. Haar ‘heden’ is verdwenen. Vertical cinema, films that walk. Horizontal cinema, films that are recumbent. Between them is a time outside time, the same duration alien to the laws of work, of reason and of health. How, and until when, can a life be extended once it seems to have left itself behind? What virtual actions remain latent within what appears to be the most complete inaction? From indefatigable walking to the fatigue of the recumbent, the spectacular reversal of postures is also accompanied by a shared perseverance: Wang Bing’s gesture consists in disengaging from the core of exhaustion the ultimate fragments of the possible.